Load up Wonder World by Novomatic and enter a world full of slot game wonder! When you open this slot game you’ll head up into the clouds and you’ll enter a world filled with magic and wonder. There are wizards, witches, fairy-tale castles, mythical creatures and magical objects – all of which will help you get closer to that desired big win! This game is perfect for fans of other Novomatic slot games like Lucky Lady’s Charm Deluxe, Mermaid’s Pearl Deluxe and Book of Ra Deluxe. It’s also perfect for beginners as it’s easy to understand on account of its 5 reels, 5 paylines and easy-to-win free spins. Why stay in the real world when you can let this slot take you far way, up into the clouds and into a world where you can revel in the wonder and the magic and take home some seriously big wins? In this world of wonder, there are plenty of unique symbols which, when they fall in winning combinations, will pay out and increase your credit balance! Some symbols pay from two or more and some symbols pay when you spin at least three of them. Wonder World slot pays out when matching symbols fall on consecutive reels from left to right and from right to left. Payouts will vary depending on the size of your bet, which you can easily increase or decrease using the plus and minus buttons respectively, and you can check the paytable to view exact amounts according to your current bet. The minimum bet in Wonder World is 0.10 per spin. In ascending order of value, you’ll find these wondrous symbols on the reels of Wonder World: the card value symbols from 10 through to the Ace; the fairy-tale castle with its tall turrets; an open book of spells; a beautiful blonde witch; a crystal ball; a wizard holding his staff and a stunning, white unicorn. 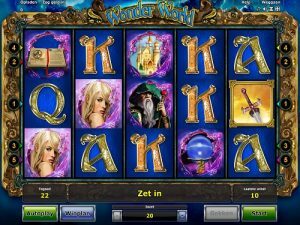 There are three special feature symbols in Wonder World slot, two have been mentioned and one has not. The two already mentioned are the wizard and the unicorn. The wizard is special as he is the Scatter symbol. Those familiar with Novomatic slots will know that their Scatter symbols can pay wherever they land as the normal payline and winning combination rules don’t apply to Scatter symbols! The unicorn, on the other hand, is the Wild symbol and slots fans will know what this means! The unicorn symbol, in this game, can substitute for most of the other symbols, except the wizard and the third special symbol, which is a magic sword! This magic sword is the last of the special symbols and you’d be right if you think we’ve saved the best for last. This sword symbol triggers free games! Whenever you spin three of these sword symbols, you’ll trigger 10 free games and, before they start, you’ll need to choose one of the three symbols to reveal a win multiplier (either x2 or x3) which will apply to all the wins you get during the free spins. You can win additional free games during them, and the best part is that the number of free games you win will also be multiplied! This can prove to be an extremely lucrative feature so look out for the magical sword and pick the right one. NovomaticCasino.co.uk is filled with all the best things from the wondrous world of Novomatic, including this popular slot Wonder World. We have all of their best and most-popular slots, as well as Novomatic table games and live casino games. Novomatic’s table games are some of the most rewarding games to play online as the RTP percentages they offer are simply unbelievable! The newest addition to the world of Novomatic are their live casino games, such as Live Poker and Live Roulette, which give players the most authentic casino gaming experiences available anywhere other than a real casino! Players can play with real people at real tables with real dealers, from anywhere they can find an internet connection.